A woman holds up Japanese electronics giant Hitachi's new quartz glass plate technology, which can be used to store data indefinitely, in Tokyo on September 24. The company on Monday unveiled a method of storing digital information on slivers of quartz glass that can endure extreme temperatures and hostile conditions without degrading, almost forever. As Bob Dylan and the Rolling Stones prove, good music lasts a long time; now Japanese hi-tech giant Hitachi says it can last even longer—a few hundred million years at least. 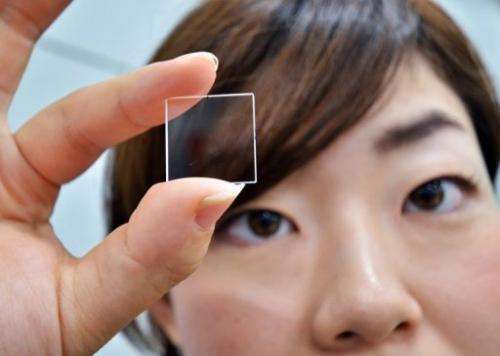 The company on Monday unveiled a method of storing digital information on slivers of quartz glass that can endure extreme temperatures and hostile conditions without degrading, almost forever. And for anyone who updated their LP collection onto CD, only to find they then needed to get it all on MP3, a technology that never needs to change might sound appealing. "The volume of data being created every day is exploding, but in terms of keeping it for later generations, we haven't necessarily improved since the days we inscribed things on stones," Hitachi researcher Kazuyoshi Torii said. "The possibility of losing information may actually have increased," he said, noting the life of digital media currently available—CDs and hard drives—is limited to a few decades or a century at most. And the rapid development of technologies has resulted in frequent changes of data-reading hardware. "As you must have experienced, there is the problem that you cannot retrieve information and data you managed to collect," said Torii, apparently referring to now-obsolete record players and cine films. Provided a computer with the know-how to understand that binary is available—simple enough to programme, no matter how advanced computers become—the data will always be readable, Torii said. The prototype storage device is two centimetres (0.8 inches) square and just two millimetres (0.08 inches) thick and made from quartz glass, a highly stable and resilient material, used to make beakers and other instruments for laboratory use. great for worthwhile stuff but the last thing you want is religion surviving into the future. we need progress not another dark age. Reality will continue into the future with or without your approval. How do you write information on this thing? Do you need to manufacture the material with the information already inside, or can you record it later? Last for a long time or not, we're in the age of single drive terabyte storage. If you can't get at least close to that much while using the same amount of physical space this will never be anything other than a niche tech, if it even gets to that. The reason religious organizations are targeted as buyers of this technology is because they tend to have huge amounts of data. I am not talking about your local church or temple ... but the organizations to which they report. The Catholic church, which used to rule the world, has an archive that is private, but could possibly be close to the size of the library of Congress. They have history, letters between rulers, state documents, lists of people who were baptized. the Mormon church is very family oriented , and in every population area is a family history center, where anyone from the general public can use their computers to trace genealogy. As a public service this church tries to keep an alternative backup of birth records, SSN's, and death certificates from every government source they can find. A standard 3½ inch drive is roughly 300 cm^3 in volume. The volume of one of those squares is 0.8 cm^3. If they are currently at 40 MB per chip, that gives you 15 GB in the same volume. You can think of it like a stack of glass cards the size of an ordinary hard drive. Thinning the glass down, increasing the number of layers and making the dots smaller and more tightly spaced will easily multiply that number to around half a terabyte. If it comes down to information density, holographic encoding by the spatial distribution of the dots could be used to store an enormous volume of information in the glass chip, which can be revealed by shining coherent light at some selected wavelenght at the glass, at different angles. Different angles reveal different patterns recorded in the hologram, even to the point that you could in theory project a movie onto a wall by turning the glass square in front of a lightbeam. What that means is that you can read the data if you have a prism and some sunlight, because the sun is a pretty coherent light source by the virtue of being so far away. The prism is used to select a wavelenght, and the light shone through the glass reveals the pattern. I think we should record everything we can, daily news, textbooks ... all of it so that the intelligent species that one day becomes aware of our scant ruins can learn from our folly. is this truly glass? Glass is a very, very viscous liquid that still flows over time, as noted by the thicker-at-the-bottom windows of old buildings. Would the quartz glass be susceptible to flow and if so over what timeframe would the information degrade? If it's kept flat it wouldn't degrade in that manner except over many centuries. One flaw I noticed right away is cosmic radiation and even radiation from the decay of carbon 14. Such particles from "natural" radiation could eventually degrade a glass chip over long enough time scales. After all, this is how the majority of non-smoking, non-asbestos related cancers are believed to be caused, i.e. ambient radiation. If it can destroy DNA it can destroy data on a glass plate. HOWEVER, depending on the type of data, errors of one bit, or in some cases as much as a byte or two, could be corrected by future scholars with minimal trouble. One use of this would be a world "rosetta stone" writing all known words and meanings. alg - "Glass is a very, very viscous liquid that still flows over time, as noted by the thicker-at-the-bottom windows of old buildings"
Not only that, but there's ancient glass that's repulsed by gravity and is thicker on top. There's also old glass that is thicker on the left or right edge, suggesting flow due to deceleration of the earth's spin. I used to think it flowed too given enough time, then read about how it was manufactured, then surmised that the glasssmiths noticed the difference, and installed the glass in its strongest and most attractive orientation (when they cared that is) .. thickest end down. These things remind me of the Star Trek episode "All Our Yesterdays"..
xen_uno, I think your last statement is really the only relavent one. The manufacturing processes at the time were not exactly what you would call exact in any means. I have seen them employed and there is always some sort of imperfection and not just in little bubbles. The ones with it on the side were probably just put in with the thicker part on the side. If your really wondering check out ancient telescopes for this same effect ;) you wont find it because the glass hasnt had time to flow and they were manufactured with a much finer attention to the thickness and shape. Sure maybe with enough time glass does flow. But I doubt I will be around long enough to care that my data has degraded due to it. The Idea of using quartz to store data is a little old but I'm glad to see science is catching up with fiction. I will be watching this to see where it goes. I have experimentally proven that glass flows. About 30 years ago I placed a 20 ml pipette in the back of my toilet for safe keeping, as it is the best protected place in my house for such a thin and long piece of glassware. After about 15 years I noted that the glass rod had sagged under it's own weight, by around 1/4 of an inch in the center. how hot is your toilet? Data that lasts forever unless the media breaks. How novel. Fanatics, psychos, the hateful and jealous, the ignorant, they didn't give a hoot about priceless heritages. Statues smashed, books and whole archives burnt down. Even magnificent, gigantic creations such as the Pyramids were vandalized for building materials. I'd imagine a horde of future barbarians making short works of a trove of useless glassy trinkets with stone clubs! This looks like a twist on the "micro-dot", but my concern about data storage for a very long time is its not hard to imagine thousands of years from now, no one will know how to access an ancient technology. Or know it is a technology. Just figuring that out may be the most problematic. Sounds like very good results for long-term data storage of all kinds. But of course it's quantum mechanics that "bites this in the a**" every time. Could this data last as long as microscopic fossils, buried for millions of years, we can find intact under our feet? There are different types of glass, if you pick the right one your data should last as long as spent fuel rods. I really doubt so, until the information density remains sufficiently high. The glass is semisolid and it has a tendency to fill tiny holes spontaneously in timespan of few minutes. if there is so much problem with this technology, before it's given a chance to be perfected, then why the hell are nuclear power plants pumping-out waste that will be around aeons from now--& the future intelligent life might not have a clue what it is all about when they learn of its existence! I really doubt so, until the information density remains sufficiently high. The glass is semisolid and it http://physicswor...at-glass to fill tiny holes spontaneously in timespan of few minutes. They're not making holes, they're using laser heating to change the index of refraction of the glass, which means they're basically tempering the glass at the spot where the laser hits, which changes how it bends light. It's a much larger scale phenomenon than the radiation damage the article deals with. On another tack: somethin like this is likely to be the basis of library collections on future colonies, in the Moon, on Mars, and in orbit around some of the other planets. Absent a way to write and read the stored data efficiently, I'll have to consider Hitachi's accomplishment as nothing more than a 'proof of principle.' Yes, we can use technology to make data last a long time. But there's nothing on the commercial horizon right now for actually using a method like this to store anything. If anything, we're moving in the other direction. The denser we make our storage media, the less likely it'll be to last for decades, let alone millions of years. If we pursue spin states as storage media, data will be even more fragile. So how much impact force would it take to break the quartz? Not long ago, the first magnetic media could store only a few kilobytes on huge rolls of tape and took minutes-to-hours to read and write, and now people are complaining that this PROTOTYPE can only store 40 MB per square inch? Sorry, your opinion is invalid.